Though things were looking good for Spike TV’s The Kill Point series, it won’t be coming back for a second season. 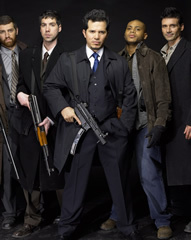 Kill Point stars John Leguizamo as Mr. Wolf, the leader of a small group of Marines who’ve recently returned from Iraq and decide to rob a major Pittsburgh bank. When things go wrong, the troop is forced to take a dozen hostages and Wolf finds himself battling the police, the hostages, his team members, and his own personal demons. On the outside is Pittsburgh Police Department Hostage Negotiator Horst Cali (Donnie Wahlberg) who goes head-to-head with Wolf to free the hostages before the FBI takes over. The series also stars Michael Hyatt, Tobin Bell, Jeremy Davidson, Leo Fitzpatrick, Frank Grillo, and JD Williams. The show is cable channel Spike TV’s first original drama and debuted on July 22, 2007. Though Kill Point received mixed reviews, the drama did well in the ratings. It averaged 1.8 million viewers and a 60% increase among Spike TV’s targeted 18-34 male demographic. A faithful audience followed the action through the eight episode season to the conclusion of the bank robbery storyline. Though there would have to be quite a few cast changes, it looked pretty certain that Kill Point would be back for another season. Now it looks like that certainly won’t happen. Spike TV has now confirmed that they’ve cancelled Kill Point. It seems that the channel would prefer to sink their budget into unscripted reality programming rather than original dramas. A Spike TV spokeswoman told the Pittsburgh Post-Gazette, “We are out of the serialized one-hour business. We need programming that we can repeat.” Though serial dramas don’t tend to attract many viewers in reruns, a rebroadcast of Kill Point’s pilot attracted 1.2 million viewers, a 70% increase over the previous year’s audience for that date and time. One of the Kill Point’s producers, Todd Harthan, offered some more insight into a possible reason for the change of heart. He said that the channel was initially excited about their ideas for season two but communications broke off as the writers strike was looking more and more imminent. Stay tuned! the kill point i love, more season please. The Kill Point is simply the best drama.I am looking foward for new season. Let me add my 2 cents worth—it was a very good series, so I’m not surprised. Just like HBO— which actually planned on ‘Rome’ getting cancelled after two seasons then when it ‘hit big’, HBO couldn’t get rental extensions on the shooting sets and Rome locations for a third year—Spike showed it’s incompetence—and that it’s completely out of touch with what people really like by .